Have you had a month like me? Life gets in the way. Tammy gets in the way. Tammy lets life put things in the way. Yes, getting side-tracked and off-track describes April 2017 for me! I haven't written a newsletter since March 22. One of my favorite pastors always said "If you can hold it, do. But if you can't hold it, we want to hear from you!" This thought has been rolling around in my heart and head for longer than a couple of months. So, today, you're hearing from me 'cause I can't hold it any longer. What happens when thou shalt not becomes thou shalt? God spoke the ten commandments into existence in Exodus 20. Most of us can quote the six or seven "Thou Shalt Not's" from memory that God carved into a stone tablet. These commandments give us guidelines of what we should not do. Thou shalt not kill, steal or lie. Thou shalt not curse, have affairs or want your neighbor's stuff. Thou shalt have no other gods before me or worship graven images. Thou shalt not means it's a no-no, don't do it, not-ta, no sirree! Fast forward to the birth of Jesus and let's look at his "Thou Shalt's" in Mark 12:30-32. There are only two. Thou shalt love the Lord thy God with all thy heart, and with all thy soul, and with all thy mind, and with all thy strength: this is the first commandment. And the second is like this, namely this, Thou shalt love thy neighbour as thyself. 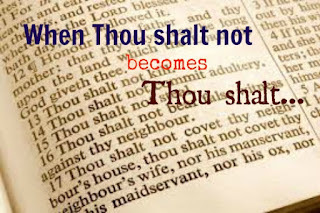 The "Thou Shalt Not's" were wrapped into two simple commandments. When you love God and your neighbour, you don't desire to kill, steal or lie, curse, commit adultery or want their stuff. When the Lord thy God is first in your life, everything else falls into the right places. Isn't it a miracle to think about how Jesus changed the world? From law to grace. From guilty to not guilty. From condemnation to righteousness. From death to life. From lost to found. What happens when thou shalt not becomes thou shalt? A world is saved. A Kingdom is come. Grace is sufficient. There is Peace on earth. Goodwill to men. Most people don't come to church to hear what they should do but what they shouldn't do. Let us be encouraged for what thou shalt do because there is none other commandment greater than these two. Jesus simplified things for his people. We don't have to remember ten, only two.